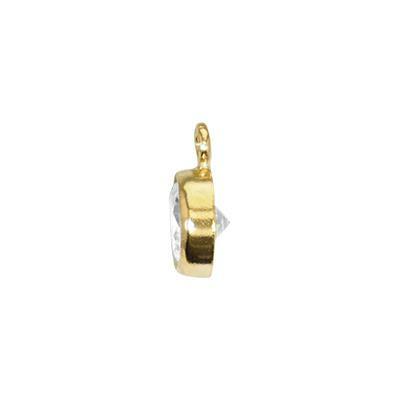 14/20 Gold Filled 4.7x6.7mm Bezel Charm with 4mm Clear CZ, 1mm Closed Ring ID, 2.4mm Depth. Facet cut stone has a pointed culet at the back for maximum light refraction. Outcharmed! 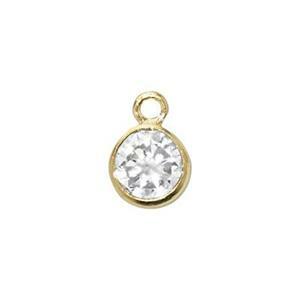 Our GF84CZ – 14/20 Gold-Filled Bezel charm with 4mm Clear CZ. Diamond or CZ is the birthstone for April. These have a 1mm Inside Diameter closed ring – which will accommodate a 19 gauge jump ring or smaller. Because of its low cost, durability and close visual likeness to diamonds, the CZ or Synthetic Cubic Zirconia is a great substitution. They are 1.7 times denser than a diamond with just a slightly less refractive index. The CZ is visible from both the front and the back. A charming addition to your jewelry supplies! We have a large selection of CZ set jewelry findings at Halstead. Click to browse now!